A pear is an edible fruit. Its shape is a teardrop. The flavor of pears is best when they are cool. They are juicy. Pears do not ripen well on trees. They can be soft in the center. They can be baked, canned, frozen, or eaten fresh. They can be made into jams, jellies or juice. They can also be made into pies and put into salads or baby food. They are eighty three percent water. It has a green, red, yellow, or brown skin. The pear originated from Europe, Africa and Asia. Pear trees grow in heavy soil. Pears are in the subfamily Maloideae with apples. It is a subfamily of the family Rosaceae. 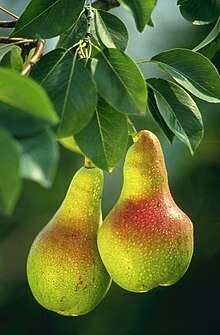 The pear comes from the tree Pyrus communis, also called the common pear tree. The tree can be 10 to 20 metres (33 to 66 feet) high. They live an average of 65 years. It starts as a pyramid-shaped tree. As it grows becomes rounded. It ends up becoming oval. This tree has gray bark covered with cracks. Its leaves are dark green and 10 centimetres (3.9 inches) long. The flowers are pink or white and up to 1.5 centimetres (0.59 inches) long. The pear needs soil that is neither too dry nor too wet. It grows best in temperate and humid climates. According to Pear Bureau Northwest, about 3000 known varieties of pears are grown worldwide. The pear comes from Eastern Europe and Western Asia. It grew during the Neolithic era. Its standard form is the result of different hybridizations from wild specimens. The pear was also cultivated by the Romans, who ate the fruits raw or cooked, just like apples. ↑ "pear - tree and fruit". Encyclopedia Britannica. Retrieved 12 March 2015. ↑ "Pear Varieties". Usapears.com. Retrieved 11 October 2016. ↑ Toussaint-Samat, Maguelonne (2009). A History of Food. John Wiley & Sons. p. 573. ISBN 978-1-4443-0514-2. This page was last changed on 20 August 2018, at 15:29.